“I was struggling a lot before I met Darren. I was living in a care home and couldn’t do simple things like eating properly or washing. I was suffering from social anxiety, and would eat my food in my room in order not to have to socialise with anyone. 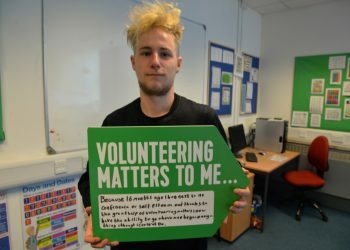 My social worker got in touch with Dionne, of Volunteering Matters in Ipswich after I left statutory care at 18, which is a very difficult transition to make. Dionne invited me to a ‘soft matching’ event, in order to see if my potential mentor and I were suited. I immediately clicked with Darren. I was so impressed by his sales techniques at a charity fair, I thought “I want to be like him.” I somehow saw something in him that I believed I could develop in myself, namely confidence and ambition. Dionne, rightly, felt that I would benefit from an experienced person who could give me clear life advice and, most importantly, help me to develop goals in life. He made me believe that anything is possible. Before I met him I had never had something to believe in. He taught me that if you know what it is that you want to achieve then there is no reason why anything should stop you. He also showed me that discipline and being reliable are vital parts of being a success. I was having a lot of trouble sleeping, and was spending too much time playing video games. Darren was patient because he knew that I had to want to make positive changes to my habits. Through his support, I have been able to do simple, but vital things, like going to the dentist, looking after my diet and being more understanding of myself, and others. My ability to hold relationships and communicate has been turned around completely. I can’t thank him enough for everything he has done. For example, I missed a benefits appointment because I overslept, and this led to my missing out on payments for several months. Darren contacted our local MP and immediately the missing money was sent to me. I am now doing a Prince’s Trust course, which is a big honour- and a huge step up for me. I was selected in order to develop my leadership skills and to support voluntary projects. I have helped with planting a garden for the elderly. The biggest challenge was our outward bound residential training, in which I had to conquer my fear of water and heights. There is no way I could have got through a scheme like that before I was mentored by Darren. Volunteering Matters continues to be a huge part of my development. I have volunteered in the office for two weeks for my Prince’s Trust work experience. It was great to be able to give something back to Grandmentors as I helped to create a ‘soft-matching’ event at a zoo.